The state government announced Rs 1 lakh relief for every worker, but has failed to penalise employers. Paras Rawat first worked in the sandstone mines when he was 10. He helped his father Dev Karan drill and turn the grey-brown sandstone into slabs of 2x10 square feet. Slowly, he became part of an annual migration from his village Sheopura in Rajasthan’s Ajmer district. Every November, entire families headed to the sandstone mines in the districts of Bhilwara and Bundi, about 200 kilometres away, and returned home nine months later when work stopped in the quarries during the monsoon. Ten years ago, Rawat’s father, uncle Polu Rawat and his wife Hagaami Devi, who worked in the same quarries, grew weaker and developed trouble breathing. Rawat looks frail for his 30 years, and breathes slowly, with difficulty. Last December, he was diagnosed with silicosis, a fatal respiratory illness caused by inhaling fine silica dust through prolonged exposure in sandstone mines and quarries. While working at the mines, Rawat had unknowingly endangered himself, in the same way that the elders in his family had. In Rajasthan, in the last four years, 5,307 workers have been identified as suffering from silicosis by government medical boards. Activists say that the actual numbers are higher since many workers are not able to access the boards. Silicosis is among the list of occupational diseases recognised by the Employees Compensation law which dates back to 1923. The law mandates that employers pay compensation to workers who suffer injury or disease that may result in a worker's death or disability. On August 9, Lok Sabha passed an amended law which makes it compulsory for employers to inform workers of their right to compensation in case of illness or injuries at the workplace and lists the penalties for employers who fail to do so. But the experience of mine workers in Rajasthan's villages shows they have had to struggle to first get a diagnosis and then prove they suffer from an occupational disease. In a few cases where workers such as Rawat have managed to get a diagnosis and compensation, it is in the form of relief paid by the state government on orders of the State Human Rights Commission for infringement of their right to life. Mine owners have managed to get away without paying workers compensation. Paras Rawat who worked in Bhilwara's sandstone mines as a child labourer has silicosis. He has watched his father, uncle and aunt die from the same disease. In July, a few metres from Rawat's house, Ranni Devi, who is in her mid-30s, lay struggling for breath while her three-year-old infant daughter lay ill on the floor. Ranni Devi's husband Mewa Singh who worked in the sandstone mines in Dhabhi in Bundi district was diagnosed with silicosis and died four months ago. She was too ill to be taken to the government hospital in Ajmer for diagnosis. On August 2, she died. A similar pattern of illness and death can be found in many villages in Ajmer, where entire families belonging to Dalit and backward castes migrate every year to work in sandstone mines across Bhilwara, Bundi and Kota districts. Most own no land or very small holdings. Some had taken advances of up to Rs 5,000 from local labour contractors that forces them to return to the mines. Others said they found it difficult to find alternate livelihood that guaranteed work for 8-9 months at a stretch. In Devipura village in Masuda taluka, 47 Meghwanshi Dalit families had at least a member each working in the mines in Bijoyliya and Dhabhi. The village has witnessed three deaths from silicosis in the past year, including two men in their early 20s. Meghwanshi said both her sons worked in Swalka Mine in Bijoyliya. But without any written contracts or pay slips, she had no way of proving this. Twenty kilometres away, in Devaji Kheda village, older workers who have now been diagnosed with silicosis say they have witnessed 72 others from the village die from similar symptoms. But no one was able to claim any compensation from their employers. “We were seven brothers, all of us worked at the mines, breaking and drilling sandstone,” recounted Poonam Singh, who fell ill ten years back, when he was 40. On many days, Singh is not able to get up from bed and coughs blood. “My brother Prabhu, Kalu, Ghisa, Kallo and my nephew Teju too died this way,” he said. Ranni Devi's husband Mewa Singh died of silicosis four months back. She was bed-ridden with a respiratory illness but died on August 2 before she could be diagnosed. Dr Neeraj Gupta, the head of respiratory medicine at the Ajmer hospital, is a member of the medical board that meets monthly to diagnose silicosis patients from three districts. He said that since January 2015, the board had examined 899 workers, of whom 482 were suffering from silicosis. “Those who work in mines and stone quarries inhale dust powder which deposits in their lungs,” explained Dr Gupta. “A fibrosis sets in which makes the lungs stiff. Slowly the workers' breathing capacity reduces, till one day they cannot breathe at all.” In most instances, workers are not aware of the risks of fine mineral and sand dust, he said. He added that while silicosis had no cure, it could easily be prevented if mine and quarry owners adopted wet drilling which reduced the amount of dust in the air. This would cost Rs 10,000 to Rs 15,000. But mine owners are reluctant to spend even this small amount. The mining department requires mine owners to provide protective gear to workers and adopt wet drilling, but has little resources or staff to implement this. 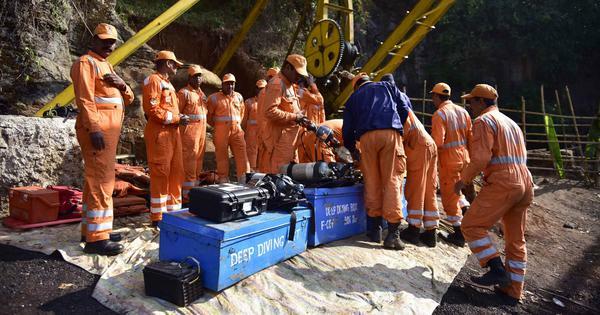 For instance, in Bijoyliya, three department officials – two foremen and one engineer – monitor 1,556 sandstone mines, of which 140 are large mines spread over 4 to 5 hectares. The Employee Compensation law gives a “factor” for working out the compensation to be paid to mine workers. It is based on the worker's age and monthly wage. For instance, in the case of a mine worker who contracted silicosis when he was 30 years old, a “factor” of 207 will be multiplied by half the monthly wage. For the mine workers in Bhilwara, this comes to Rs 3,000, making a worker eligible for Rs 6.2 lakh as compensation in case of death or disability. It would be higher for the workers who got the disease at an even younger age. But activists say the state government has done little to enforce these compensation norms on employers. After the Rajasthan State Human Rights Commission took suo moto cognisance of widespread silicosis among workers in 2012, the state government announced payments of Rs 1 lakh to patients certified by the hospital boards, and Rs 3 lakh to families of those who died after being diagnosed with the disease. The money was paid by the Rajasthan Environment Health and Administrative Board of the mines department. “Under the Employee Compensation law, the workers would be entitled to more,” said Vikas Singh, a project officer with Gram Samajik Vikas Sanstha, an NGO that works with migrant workers. He estimated the amounts would be anywhere between Rs 5 lakh and Rs 10 lakh. RK Mishra, the secretary and labour commissioner of the state, said workers are entitled to compensation under the Employees Compensation Act but the onus was on them to establish they had worked for a particular employer. “This does not have to be formal documents, we would accept any other proof too,” he said. Jagdish Patel who heads the People’s Training and Research Center that researches occupational diseases said that the payments being made by the Rajasthan government did not amount to compensation, but only to some immediate relief. Poonam Singh has lost five family members to silicosis. In December 2015, Singh got certified as having silicosis by a medical board, that makes him eligible for Rs 1 lakh from government. But he has got no compensation from his employers.